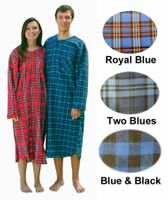 Snuggle up in our 100% Cotton Flannel (4 oz. 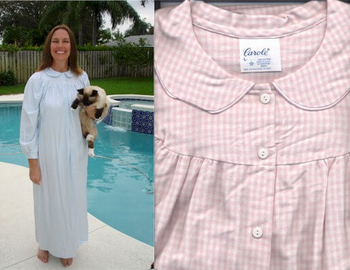 - lightweight - average weight for a nightgown in size Large would be 14.5 oz) nightgown now in a Pink and White or Blue and White checkered pattern in a long (50.5 inch) length and long cuffed sleeves. This soft gown features a two button front (no pockets). Machine wash and dry. Quality made in the USA of imported fabric in a full cut to allow for shrinkage. Sizes Small to 3XL - see size chart light green in the center of this page. Sizes 2XL and 3XL are $3 more per nightgown. 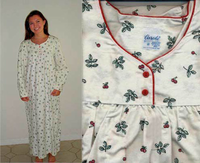 MEASUREMENTS: Our Ladies Flannel nightgowns are all made in the USA by the same company and have the above measurements (before shrinkage - shrinkage would probably be 1 inch across, Armhole to Armhole, and 2 inches in length. Width 23 in. 25 in. 27 in. 29 in. 31 in. 33 in.